Big waves and rainy days….. The surf forecast has been showing a big increase in swell today and tomorrow for a little while now – luckily my super surf instinct told me to make sure we didn’t book anyone into surf school over the next few days as the conditions aren’t really going to be any good for anyone experiencing their first surf session….it would be more like a surf survival session down at Watergate Bay, with a serious amount of white water, gale force winds and super strong currents to contend with! 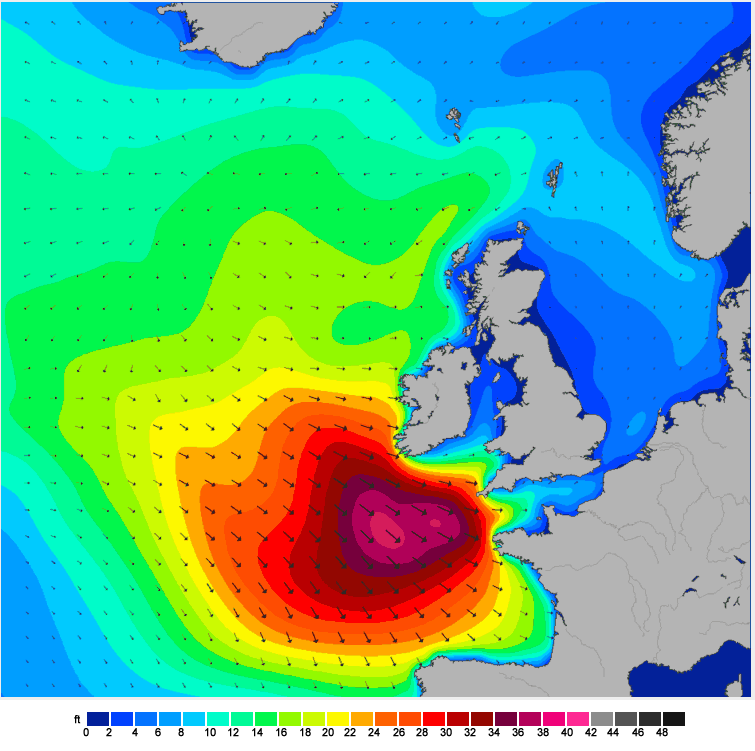 I have been keeping a close eye on the forecast today – I tend to use magicseaweed and windguru to work out what’s happening where. There’s lots of measurements of swell size, swell direction, multiple swell direction, wind direction, wind and gust strength, tide, beach direction, sandbanks and a million more other things that all have to be taken into consideration when choosing where to surf…..luckily for me I’m bit of a super geek when it comes to these things and over the years have done more than my fair share of research in order to help me understand the way of the waves. These sites simplify things down for you a little, rather than having to look at a scary pressure chart.You don’t have to be an ocean scientist to work out what the waves are going to be like – these guys do all the hard work for you! There are also so many webcams now you can check most spots, or spots nearby your chosen surf destination before you go. This can save you a lot of miles and a lot of fuel money!! So, for me and my friends tomorrow will mainly be spent chasing waves. When the wind swings to the north and the swell comes from the south there’s only one place to head to…….but I’m not going to tell you – It’s a secret! ← Surf contest this weekend…….